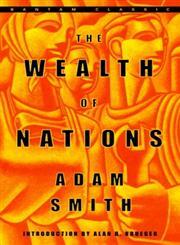 The Title "The Wealth of Nations " is written by Adam Smith. This book was published in the year 2003. The ISBN number 0553585975|9780553585971 is assigned to the Paperback version of this title. The publisher of this title is Random House. We have about 83892 other great books from this publisher. The Wealth of Nations is currently Available with us. 1. Many of the concepts developed by Adam Smith in The Wealth of Nations-the nature of free trade, laissez-faire, the division of labor-were revolutionary notions in 1776, and remain central to contemporary liberal economic thought. Discuss contemporary economics in light of some of the key notions elaborated by Smith. 2. Smith famously writes: “It is not from the benevolence of the butcher, the brewer, or the baker, that we expect our dinner, but from their regard to their own interest. We address ourselves, not to their humanity but to their self-love. . . .” What does Smith mean by “self-love” or “self-interest”? 3. As R. H. Campbell and A. S. Skinner write, The Wealth of Nations “was not only an intellectual achievement . . . embracing as it does the explanation of complex social relations on the basis of a few principles, but also a work which provided practical prescriptions for the problems of the day.” Discuss these aspects of Smith’s work-analytical and prescriptive or historical; what is their relation? Is the one necessary for an appreciation of the other? 4. In his Introduction to this volume, Robert Reich notes that “The Wealth of Nations is resolutely about human beings-their capacities and incentives to be productive, their overall well-being, and the connection between productivity and well-being.” How does this statement, taken as a point of departure, shed light on Smith’s book and its significance? 5. Although he is considered the founder of political economy (or modern economic thought more generally), Adam Smith considered himself a moral philosopher. How does looking at him in this way-as someone fundamentally concerned with questions of ethics-change your understanding or appreciation of his work?From the Trade Paperback edition.